In a LinkedIn Influencer post a few weeks ago, I introduced a concept called Career Zones – Why Working in Zone 1 is So Inspiring. The concept is summarized in the graphic below. 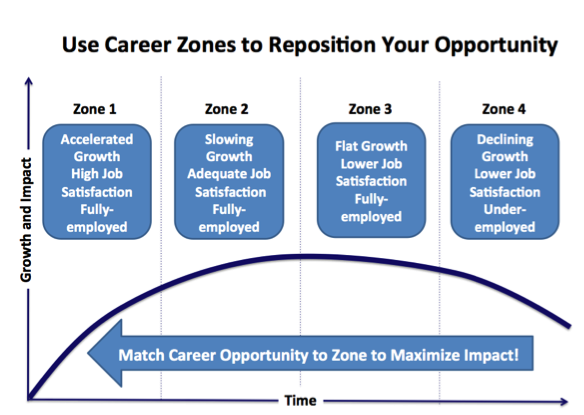 The Career Zone curve represents growth and impact over time. Job satisfaction tends to decline as time goes by due to a reduction in personal growth and learning. This is shown by the flattening of the curve. As job satisfaction declines, job-hunting activity increases. 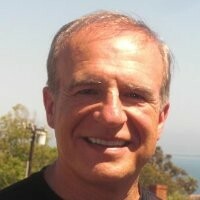 Continuous growth tends to maximize job satisfaction. This is represented by Zone 1, the steeper part of the curve. Many people reach a point of equilibrium doing work they find extremely satisfying. This is typically in the early portion of Zone 2. Make sure your messages follow the rule of the “3 Cs” – compelling, career-oriented, and customized. Whether it’s a job posting, email, InMail or voicemail, people in Zone 1 or Zone 2 aren’t the least bit interested in switching jobs to do more of the same. Since these people already have a great job, you need to offer a great career. Here’s an example of a job posting for a controller that achieves this objective – offering a Zone 1 opportunity for those in Zone 2 and beyond. Note how the post quickly captured the person’s intrinsic motivator in the beginning of the message. 2-3 minutes into the first contact, you need to find out where the person is on the Career Zone curve and then shape your underlying recruiting approach. Once you have a person on the phone, the recruiter needs to find out if the person is looking, determine if there are any short- or long-term concerns, and ask if the great job they have is also a great career. To get the candidate to move forward in the process, the recruiter needs to position the opening as a potential career opportunity using job stretch and more rapid job growth as the reason for another conversation. While people in Zone 1 and Zone 2 might be open to explore a new opportunity, it’s a slower process than for those in Zones 3 or 4. Unfortunately, most recruiters go into a box-checking transactional mode as soon as the person expresses some level of interest regardless of the Zone they’re in. When dealing with people in Zone 1 or 2, start the call by selling a very short discussion about a possible career move, not with a crude attempt to quickly fill an open job. While recruiters can set the stage, the hiring manager needs to be the focal point. People in Career Zones 1 and 2 leave great positions for four primary reasons – significant upside potential, a great hiring manager, the chance to meet some critical internal motivator, and work that the person finds intrinsically satisfying. This is only credible when it comes from the hiring manager. Part of this is arranging an exploratory phone conversation with the hiring manager right after the recruiter has qualified and warmed up the prospect. If the hiring manager can convince the person to come onsite for a personal interview, the likelihood of hiring the candidate increases 2 to 3X. You’ll never have enough money in the budget to hire the best and brightest. Instead you’ll need to offer the best and brightest career growth opportunity. It takes extra time for a person who’s not looking to fully appreciate the potential of another opportunity, especially when compensation is not the primary driver. That’s why going slower and involving the hiring manager early is essential. Equally important is for the recruiter to understand the real job, not the job description. Preparing a performance profile (i.e., performance-based job description) when the assignment is first taken is the first of many steps. Attracting the best, especially those in Career Zones 1 and 2, is a far different process than weeding out the weak. The process starts by understanding what these people are looking for and then creating a hiring process that maps to their needs, not to someone who’s in compensation, legal, OD or IT. Understanding the customer is marketing 101, yet somehow this message is often lost when it comes to hiring. Those who find it though, discover that finding and hiring great people is a predictable business process with predictable and consistent outcomes, not a game of chance.